Brock Lesnar is no normal human. IF THERE is anyone who can judge the real world fighting ability of former UFC heavyweight champion Brock Lesnar, it's Olympic wrestling gold medallist Kurt Angle. Angle, a WWE legend, laid the trail for athletes transitioning to professional wrestling. He opened the door for Lesnar and, most recently, Ronda Rousey, to enter the sport, courtesy of his switch to the WWE after winning gold at the 1996 Atlanta Olympics. 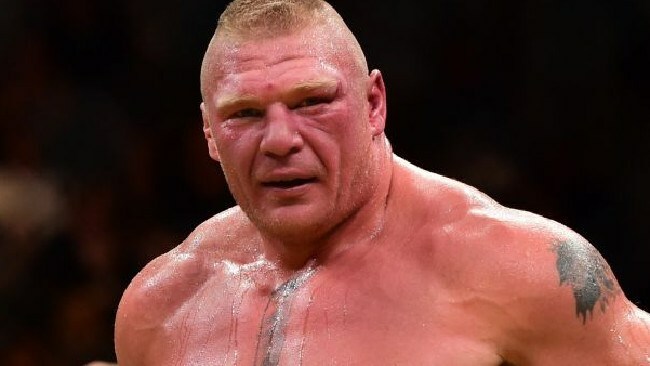 Lesnar, the WWE Universal champion, is expected to challenge dual UFC heavyweight and light heavyweight champion Daniel Cormier in the Octagon in the coming months. While the beast is an underdog against Cormier, Angle said he has witnessed Lesnar perform feats that are almost impossible to fathom. Angle remembered one incident that shows the WWE star is no match for any man - manhandling the 2.13m, then 231kg wrestling icon Big Show. "For real, they shot in the ring and Big Show was 140 pounds (64kg) heavier than he is now. I was in shock. "Brock is an animal. The only thing about Brock that sets him back is his mind sometimes. Other than that, no one can beat him. "He had three losses (in the UFC). I understand he had diverticulitis in two of the losses. It's hard to believe anyone on this planet can beat Brock Lesnar. He is an animal." 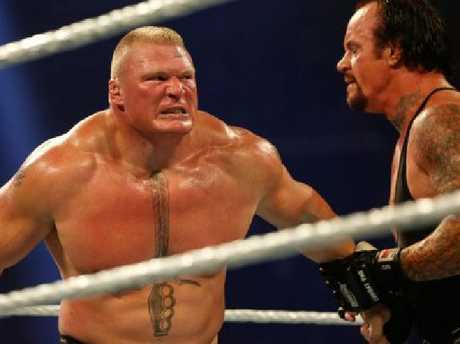 Lesnar is a physical beast. Lesnar was a former NCAA heavyweight freestyle wrestling champion in his college days, before turning to the bright lights of the WWE. From there, Lesnar made a surprising switch to the UFC, becoming heavyweight champion after just a handful of fights. The professional wrestling champion is now looking to do it again, this time against Cormier. Having shocked the world before, Angle would not be surprised if Lesnar does it again. "I think he has a good shot," Angle said. "I have a lot of respect for both guys, they were both amateur wrestlers. I think Brock's size will give Cormier a problem. I think Brock's athleticism will be a factor. "I've shot with Brock in the ring before, when we really went at it, we went at it for real. He is so quick and explosive, there's not many people that can hang with him." Many criticise Lesnar's current deal with the Vince McMahon led promotion that sees him sidelined for most of the year, appearing infrequently, despite being WWE Universal champion. But Angle said Lesnar is so unique, he can do what he likes.